If you are sitting for the Italian HSC exam in 2016 and you'd like to take advantage of the summer holidays to improve your Italian and start preparing for the Italian HSC exam, you'll find this course extremely useful. 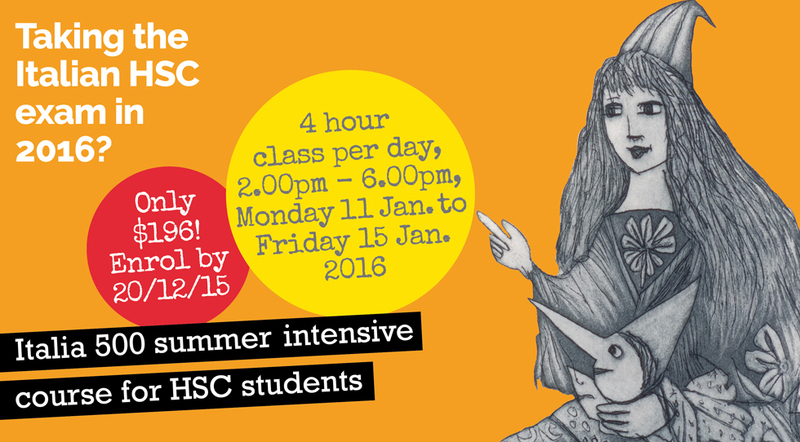 ​The Italia 500 summer intensive course for HSC students consists of one daily 4 hour lesson, over 5 consecutive days (20 hours tuition). The course does not include the Italia 500 course notes and practice CDs we normally provide students who enrol in our standard courses, nor will we be working with a textbook. However do bring along the textbook you are currently using in class and your "Italian folder" containing the extra material you've been provided in class and your written work. ​The prices above include GST and Italia 500 does not charge an enrolment or membership fee. As a group, we'll choose several topics and situations which inevitably appear in each and every Italian HSC exam. We will then write out a dialogue or story relating to each of the chosen topics and situations personalized to reflect the reality of every individual student in class. As we do this we will examine the vocabulary, useful expressions, phrases, pronunciation and grammar. We will then practise the dialogues and stories over and over until you can hold them, or recount them even in your sleep!!! Once you've learnt the dialogues and stories, we will expand on them, role play the dialogues in class, bring in new elements, modify them, combine bits and pieces to suit different circumstances and situations, and we'll introduce you to techniques to help you increase your marks. (Alas, we won't be able to cover all the possible situations and topics in the five days allocated but you will gain a better understanding of which learning strategies to adopt to best prepare for the exam. Also, we may well hold further such courses later in the year to include further topics and situations.) It will be hard work but also a lot of fun and very rewarding. If you would like to accompany your child for the full duration of the course, or for part of the course, you are more than welcome to do so: we have a wonderful library which will keep you happily occupied for hours on end! Our Italian classes are held at Italia 500 which is located in Porter House, at level 2, 203 Castlereagh Street in Sydney's CBD, between Park & Bathurst streets. The entrance to Porter House is right beside the ANZ Bank branch on Castlereagh Street. Town Hall station is only 3 minutes away. Buses and metered parking (from 6pm) are all nearby. ​View our location on Google Maps. By enrolling in our courses you agree to our Terms & Conditions of enrolment so please take a moment to read these prior to enrolling. Grazie! 1. Enrol Online with Paypal: you can enrol in our Italian courses securely online, by debit or credit card, using the Paypal buttons above, regardless whether you have a PayPal account or not. Click on the menu bars above to select your payment option and your preferred starting date, click on Add to cart, then proceed to Check out! Enrolling by Paypal with a friend or friends? Select one of the payment options, select your preferred starting date, click on the Add to Cart button &, when the Paypal cart appears, simply vary the Quantity, click on Update, and proceed to Check out! 3. Enrol via internet banking: please contact us on (02) 9261 1795 or on 0405 494 066 for our account details. ​(02) 9261 1795 or on 0405 494 066 before dropping by to ensure that the office is attended. If you have any queries whatsoever, email us at enquiries@italia500.com.au or feel free to contact us on (02) 9261 1795 or on 0405 494 066.